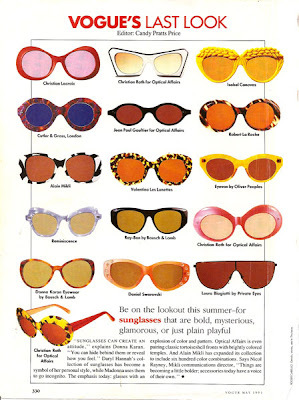 1991 Spring/Summer crop of designer sunglasses. Would these be considered vintage already? The summer of '91 seems just like yesterday....sigh. What I would do to get a pair of the dead-center Valentino pair.....summertime classics. ps, very top left please! Shapes sure have changed. There are so many rectangles now! enc, you are so right....the shapes above are refreshing compared to todays styles.